MIDTERM EXAM March 7-8; AP REGISTRATION BEFORE March 13! Study! It will be an old AP Test– MC and FRQ sections only. Bring in your checks for the AP EXAM NOW!!!!!!! Make sure you answer the questions or explain the subsection titles. Always consider the consequences and historical significance! I. How important was foreign policy to FDR, and why? How does the US deal with its empire during the early years of FDR’s administration? —–A. Trade: what does economics have to do with foreign relations? —–D. What were the economic causes for totalitarianism? II. What were the rising threats from abroad? —————a. What effect did these refugees have on the rest of the world? Quiz 33-35 on Monday, etc. Ch. 36 Outlines due Monday! 3. Continue working on your research over African Americans– Basic outline of your findings is due Wednesday, Feb. 21 FOR EVERYONE!!!! 4. Your outline for Chapter 36 notes is already posted. These are due on Monday, February 26– so you’ve got plenty of time! USE IT! Grumble, grumble, grumble— so did anyone out there already wake up and take a shower before finding out about the snow day? Of course not, because YOU are kids who don’t let a little fact like the lack of a single FLAKE of snow on the ground mean anything. WAAH! And now I’m awake and watching those morning news show people be creepily cheery while hoping I get tired enough for a good nap. 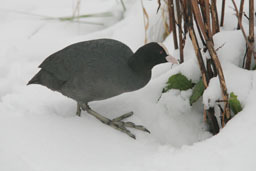 Well, anyway, here’s a picture of an old coot in the snow– that would be me later in the day, IF we get this promised– maybe “threatened” is a better word– snowfall. —-Okay, now there’s snow. But STILL. Meanwhile, I’ll give extra credit to those who come in tomorrow (or whenever we next meet) with some research accomplished on their projects (printing it off will provide proof) and a 250-300 word summary of what they have found so far. I will also give extra credit for creating a timeline of important events in African-American history. Include court cases, proclamations, and significance of events. You would want to include the first Africans brought to America, the time periods by which slavery was made legal and illegal in all the colonies, and so on. At least twenty-five items, please, and it MUST BE IN YOUR OWN WORDS and not just copied off the internet. Please make sure you have read over the poems and the Debs speech and have notes over them to bring with you for the next class. 1. Read the 14 Points and summarize each one in ten words or less… OR summarize each in a haiku. 2. Read the four poems on World War I and take notes– be ready to discuss these on Wednesday/Thursday. Bringing them with you to class might be helpful. 3. If any of you have not given me your answers to the Wilson reading, I need them MONDAY. 4. Chapter 35 Outlines are due Friday, February 16.